Starring Virginie Ledoyen, Lou Doillon, Catriona MacColl, Dorina Lazar, Jeróme Soufflet, Virginie Darmon, Marie Henry, Eric Pratt and Christophe Lemaire. Distributed by Rogue Pictures. 100 minutes. 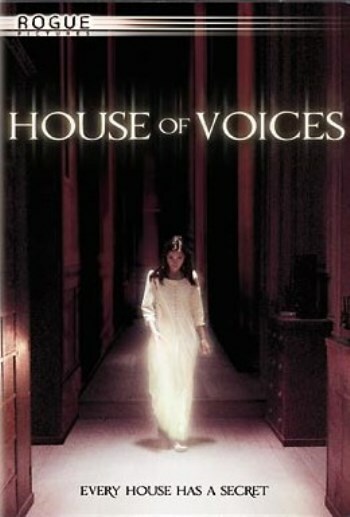 Rated R.
Released in France as Saint Ange in 2004 and then slipped straight into the video stores a year later in an English dubbed form and with a new title, House of Voices is yet another Gallic attempt to emulate American horror films. Much like High Tension (which actually made it into the theaters) it is highly stylized, looks gorgeous and is genuinely spooky. Also like High Tension, it all falls apart due to a spectacularly misjudged climax. If High Tension is a take on the stalker genre, this movie is an attempt at the good old fashioned haunted house (or in this case, haunted boarding school) story. The film takes place in 1958 at Saint Ange, a gorgeous old boarding school in a castle in the French Alps. The huge old place is rather dilapidated and many areas are unsafe. When a boy dies in a mysterious accident in an old bathroom, all the students are sent away while it is determined whether the school will be repaired or condemned. Appearing at the school on the very day it is being deserted is Anna (Virginie Ledoyen from The Beach), a disturbed young woman who was beaten and impregnated in her last position. Anna’s prenatal regimen seems rather disturbing even back in 1958 – she smokes, drinks, carries heavy items, does hard manual labor and she tightly wraps her stomach so that people will not realize she is having a child. Only as the movie goes on do you realize how totally Anna is shamed and angered by her plight and her coming child. She is shown around the school by the uptight outgoing headmistress (Catriona MacColl) and meets an older matron named Helenka (Dorina Lazar) who has worked there for decades and oversees keeping the old building in good shape until it the school’s future is decided. Saint Ange is haunted by the memory and the spirits of “the scary children,” a group of children who arrived right after World War II and died mysteriously. Only one of the children survived, Judith (Lou Doillon), a beautiful and completely deranged young woman. Judith stays at the home with the two women because she could not handle being moved. As Anna becomes disenchanted with Helenka (for reasons that seem both unlikely and excessive), Anna starts to work to get Judith to distrust the older woman as well. While the ghosts play a big part in all this, in the end the film is more about two very disturbed girls and how they react to the stress of the hauntings going on around them. One of them seems like she will move forward and heal herself. The other… well… she goes completely astray in the ridiculous ending. Honestly, House of Voices is one of those rare occasions where a movie is cut just too tightly. It does seem to run a little long at an hour forty minutes, however watching the deleted scenes (in the original French) on the DVD many plot questions are answered that do not make enough sense as the movie goes on. Also, basic story points were just ignored in the final cut – from the aftermath of a young boy’s early death to a vaguely hinted at Nazi past for the school, which may or may not have led to the haunting. Copyright ©2005 PopEntertainment.com. All rights reserved. Posted: October 22, 2005. Tags: Catriona MacColl, Christophe Lemaire, Dorina Lazar, Eric Pratt, French, ghosts, High Tension, House of Voices, jay s jacobs, Jeróme Soufflet, Lou Doillon, Marie Henry, movie review, PopEntertainment.com, Saint Ange, the beach, Video Review), Virginie Darmon, Virginie Ledoyen. Bookmark the permalink.